This original article by Sara Ryan was published first in the April 2018 issue of Concealed Carry Magazine along with a ton of other useful information for everyday personal defense! All drooling aside, I wondered if the luxurious decor and variety of amenities were a distraction from the core mission of training shooters. After all, plenty of us have gone out to the backyard and balanced soda cans along the fence line to improve our shooting and traditional shooting ranges have been churning out marksmen for decades. Are ranges like this a good development for the concealed carry community? Is this the image we want to project? Initially, I wasn’t so sure. After some research, however, I found that surprising accessibility, commitment to customer service, and enhanced skill development options may be improving the face of modern ranges forever. In my experience, the shooting community as a whole is very open-minded, freedom-loving and eager to share knowledge with newbies. Of course, private gun clubs continue to have their place and I don’t begrudge them at all. However, it is no secret that the industry’s demographics are changing and many of the new modern luxury ranges are being built within the busy commerce centers of urban and suburban communities. These highly visible businesses are potential industry stewards and must help make shooting more accessible and inclusive. They need to help make a “bigger tent” so to speak. At first glance, many of the luxury ranges I looked at seemed out of reach for the average shooter. Crystal chandeliers, marble flooring and leather-appointed cigar lounges do not exactly scream affordability. If it looks and smells like a private country club then it must have the same price tag, right? Well, yes and no. Even though some ranges charge $5,000-$10,000 initiation fees and additional monthly dues ranging from $150-$500 for exclusive private memberships, most of them are surprisingly affordable for Jane Q. Public to walk in the front door and spend an hour shooting. For example, at The Alamo’s Presidential Club, individual members pay a $4995.99 initiation fee and then $149.99 per month ongoing for all of the club’s exclusive amenities. Membership is limited to 300 people and the club’s lounge and shooting bay are access-controlled on the second level via private elevator. If you want the best in an exclusive gun club experience, this is it. At the other end of the spectrum, Jane Q. Public can walk in the front door and buy an hour of range time for $16. If Jane wants to become a member at just the range portion of the club, she can pay $35 per month for unlimited range access. For the price of only two hours of range fees, the membership includes one free gun cleaning per month, discounts on almost everything the club offers and a complimentary machine gun experience on her birthday each year! I’d call that economic inclusiveness for sure! In addition to offering a wide range of price points for range access, I found that many of the new ranges have gone out of their way to offer different products and services for women, my favorite of the industry’s changing demographics. Luxury ranges spare no expense in this area and many have dedicated female staff working the sales floor, overseeing the line as Range Safety Officers (RSOs) and teaching various levels of classes. Most clubs offer a variety of women only classes, host ladies nights with special discounts and regularly bring in guest instructors or speakers to host women oriented events. Another way luxury ranges expand the tent is by providing for families who want to bring kids and enjoy the range together. Of course, many anti-gunners will yell and scream that the ranges are encouraging violence and creating little Second Amendment monsters. I’ll sidestep this debate for the sake of brevity, but I’d say most of us who actually own guns and train with them understand that kids who are taught to properly respect and use firearms are more likely to remain safe and responsible gun owners for life. Youth programs are nothing new and many traditional ranges offer programs for young shooters, but luxury ranges have the floor space, range staff and kid friendly amenities like snack bars and game rooms to make a family full of new shooters a lot more comfortable. Almost every range I checked offered family memberships at reduced rates. 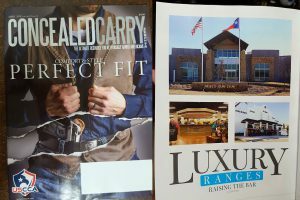 Just one peak inside Frisco Gun Club in Dallas or Stock and Barrel Gun Club near Minneapolis and you can instantly tell that this is nothing like your daddy’s range. Spacious professionally designed showroom floors, leather-appointed lounges and squeaky clean designer stone bathrooms are standard issue. Plenty of well-lit shooting lanes help reduce wait times and keep firing line crowds to a minimum. Glassed in shooting bays give family and friends a way to take and break and still watch the action. Improvements in ventilation technologies provide a cleaner and healthier range environment – a top concern among many of the women I teach. Yes, yes and more yes. Smart and clean design, state-of-the-art ventilation systems and adequate lighting make for a great atmosphere and contribute to overall range safety to be sure, but staffing is perhaps the most critical component of both safety and quality customer service. Gone are the days when a couple of range personnel try to manage the gun sales counter, range check-ins, phone calls and, oh yeah, keep an eye on the firing line. More invested money usually means more insurance, stricter enforcement of safety rules and a larger budget for RSOs. During my visit to The Alamo, Chief Range Safety Officer Collin Einsmann and walked me through the various shooting bays and explained how the company views range safety as part of its customer service and strives to have one RSO for every three shooters. This is a fantastic standard to say the least. Many of the RSOs and Rangemaster Jesse Granese are former military/LEO and are instructors as well. More eyes on the firing line is always a good thing, especially with new shooters, and it’s a nice bonus if the RSOs can provide a bit of encouragement or instruction if the shooter requests. Many of the private members-only areas have a dedicated concierge/RSO/instructor that will attend to every need. Most clubs have the budget and space to offer on-site gunsmiths and expansive gun rental counters. Speaking of gun rentals…this is one part of the luxury range experience that I find particularly valuable. One of the major points I emphasize to my beginner students is that there is no better way to decide which pistol best suits you than to take it for a test drive. Most of the ranges I surveyed have more than enough gun rentals, especially pistols, for customers to find out which suits them best or to just have a bit of fun learning about a new gun or caliber. The Alamo has over 120 guns available for rent at $15 per hour and you can swap out your gun for a new one as many times as you like. On the opposite end of the spectrum, if you’re looking for pure exhilaration, most luxury ranges have the ability to offer fully automatic rifles for rent as well. The pinnacle is the amazing variety of Machine Gun Experience rental packages available at Lock and Load Miami. Wow, could I have some fun at that range! More convenient scheduling options like priority lane usage for members, advanced lane reservations and even 24-hour bio-metric access are a few of the other services customers can utilize to get to the firing line more often. I can attest to how busy the ranges here in southwest Florida get in March and April when all the snowbirds are here and spring break is in full swing. Busy professionals may only have a quick lunch break to sneak in some range time and the ability to schedule ahead of time or take advantage of priority lane usage helps mitigate the risk of a long wait. I’ve learned first hand the difficulty of balancing my life as a mom of two with my life as a shooter. I have to admit that I would probably go to the range more often if I could go later at night after the kids are in bed. To round out their convenience offerings, most of the clubs I’ve researched offer some sort of food option on premises, ranging from small snack bars and coffee shops to full-service restaurants. Many offer private locker rooms, fitness areas, cigar lounges, conference rooms and game rooms. Services for members often include valet parking, gun storage, gun cleaning, gunsmith, laundry, lane reservations, and even private event planning. Many of these products and services serve to enhance the social aspects of club membership and provide networking opportunities for professionals and members. More power to them as long as they are able to keep range staff focused on the essentials. The bottom line for many is that there are only so many hours in a day and many of the amenities found within luxury ranges that might seem to “distract from the core mission…” allow busy people to multi-task to make time for the important stuff – you know, the shooting! I know how simply fun shooting guns can be, but ultimately, they are serious and deadly tools and we should all seek to promote more consistent training and skill development from our students and peers. Interest in concealed carry has grown over the past decade and Pew Research Center states that sixty-seven percent of gun owners name protection as their main reason for owning a gun. The people in this category that are serious about protecting themselves and their family need to do more than just go to the range and blast away with a smile on their face. 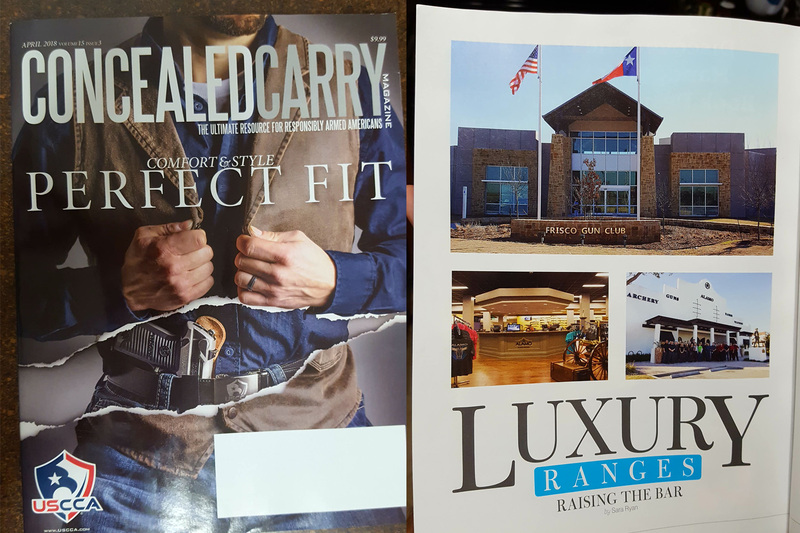 With larger budgets, more space and plenty of staff, luxury ranges have a great opportunity to capitalize on the trend toward personal protection and to help improve the overall skill level of the average shooter. I like the way that the Frisco Gun Club website puts it best: “The Frisco Gun Club is not just pure luxury…it is also a gun club designed to challenge your marksmanship skills. Determine the difficulty level of your experience with hands-on target operator consoles and individual control screens.” To that end, Frisco Gun Club offers a comprehensive Dynamic Shooting Series which includes “movement and/or changing environments and scenarios.” Dynamic shooting is one of the best ways for shooters to train in a more realistic manner and many ranges are employing modern computerized target systems that allow programming for rotating targets, shoot-no shoot scenarios, changes in distance and time randomly or otherwise make you think on your feet with firearm in hand. To supplement live-fire training, many ranges are employing computerized simulation systems to help customers add dynamics and mental gymnastics to their training regimen. For example, Athena Gun Club in Houston offers different levels of simulation based around the prior shooting experience of the customer. Using a SIRT pistol or other similar laser-equipped firearm, customers can work through different “bad guy” scenarios on a giant projection screen. Taking it even further, Reload Gun Range in Tarpon Springs, Fl offers “a 300-degree immersive training platform…(with)…optional Threat-Fire™ device that safely simulates enemy return fire with an electric impulse, reinforcing performance under pressure.” Using the latest in recoil-enabled laser guns, this type of simulation seems to be the next best thing to a live-fire shoot house. To sum it all up, I’ll ask a simple question: For the same price, would you rather drive a Ferrari or a clunky old Pinto? Both will get you where you’re going, right? I’ll admit that my favorite local range is bare-bones in comparison to the luxury gun clubs I reviewed but, as many shooters before me have proved, it isn’t the fanciness of the range that makes the marksman. On the other hand, I certainly like to be spoiled on occasion, especially when it comes to shooting my favorite guns. If ranges like The Alamo can maintain focus and deliver top-notch customer service at every price level, promote more consistent range safety and enhance customer skill development, it is easy to conclude that they are an excellent option for most of us and will benefit the shooting community as a whole. After all my research, one issue remains unresolved in my mind. I still wonder if different types of people interested in shooting are driving the development of luxury ranges or are luxury ranges and their amenities drawing different types of people through the front door to see what the fun and skill of shooting is all about?